A proposal by the Minocqua Lions Club to provide labor and materials to construct a pavilion in Torpy Park will go before the electors at a special town meeting next Tuesday, Feb. 12. This is the second time a pavilion proposal is before the town. Back in 2014 a proposal by the same club for a larger pavilion failed at a special meeting of the town electors, chiefly because residents didn’t want about a dozen white pines, some of them quite large, cut down to accommodate the pavilion. But a windstorm in April 2017 took down some of those trees where the pavilion is to be built. The proposed 60-by-96 pavilion would be located between the Minocqua Brewing Company and the current pavilion. It would have a food serving area, but no water or bathrooms. The town board last night reviewed the plans before deciding against a metal roof for a few reasons. While a metal roof would outlast a roof covered with asphalt or fiberglass shingles, the board agreed it wanted the roof to match that of the current pavilion. The cost of a metal roof would also be higher, with supervisor John Thompson voicing concerns about snow and ice falling off a metal roof and possibly injuring someone. Those holding family and class reunions, graduation parties, as well as civic clubs would use the pavilion. There’s already interest in reserving the pavilion if plans go forward, said town chairman Mark Hartzheim. The Lions want to reserve it for their use during Beef-A-Rama. Supervisor Sue Heil thanked the Lions members for their donations. The proposed pavilion is part of phase 1 of a master plan to renovate the downtown park, popular with tourists and residents due to its proximity to the downtown area and for the beach. The pavilion would become town property once completed. With that roof decision made, the board had no other changes. The special town meeting is set for 6 p.m. Tuesday at the Community Center. The electorate will be asked to vote on accepting the Lions Club’s offer. No citizen spoke either for or against a request by Rynders Companies for a conditional use permit to open a sand and gravel mine on 30 acres west of Minocqua, along Highway 70 W. Operating as Tri County Sand & Gravel, the owners plan to process five acres initially, with the lifespan of the pit estimated at 25 years. With the plan commission’s recommendation to forward the request to the county, the town board did just that. The town board wants hours of operation confined to 6 a.m. to 6 p.m. weekdays and from 6 a.m. to 3 p.m. Saturdays. No operation could take place on Sundays. Also, crushing of aggregate would be restricted to the weekday hours stipulated above, and no crushing would take place on the weekends. Crushing operations is expected to take place for up to four weeks each year. The county has the final say on the matter, and it will schedule a public hearing to gather input from the public. The state Department of Natural Resources has stipulated six-foot high berms must be constructed around the mining operation, according to Ed Rynder. Also, reclamation of the property is required once mining has ceased operation. Rynders Companies owns 320 acres where the non-metallic mining operation will take place, Rynder said. A gravel pit is a permitted use in the Forestry Zoned District, Hartzheim said. 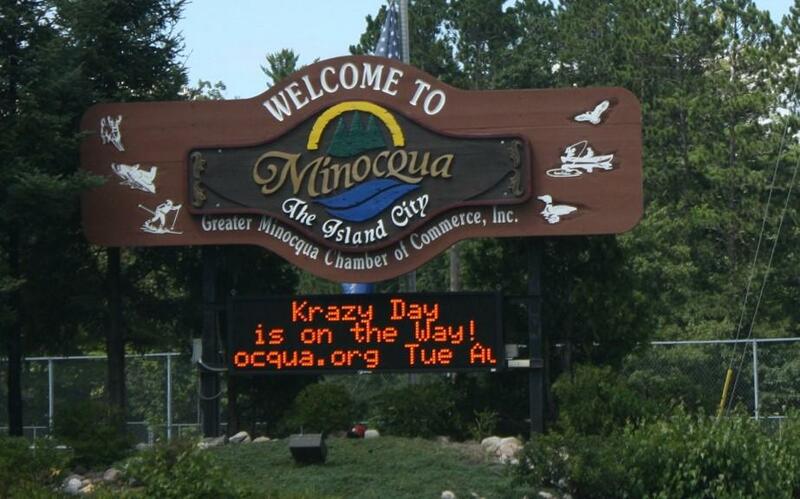 After a year’s delay, the board is ready to award a contract for purchasing and placement of individual address signs at every real estate location in Minocqua. Lange Enterprise, Oconomowoc, submitted an apparent low bid of $179,000 to do the work. The only other bid, by A&H Corporation, Ironton, MN, was in the neighborhood of $300,000. Pertile said the work would be done over the summer. He will review the bid documents to ensure they meet bid specifications, with the board to formally award the contract at its next meeting. The board also awarded a $57,686 contract to Quality Equipment, Woodruff, for purchase of a Bobcat E50 excavator. Four other dealers with different brands of excavators submitted bids. Pertile said they were all good machines, but he preferred the unit from Quality Equipment. Police Chief David Jaeger announced that he has promoted officer Matt Tate to detective sergeant. Tate, who is the department’s K-9 handler, will be the second detective on the force. His promotion becomes effective Feb. 23. Tate has been with the Minocqua department for the past six years. Buck Drossart, general manager of The Pointe Hotel & Suites, presented the chief with a check for $400 to on behalf of The Pointe to go toward the K-9 program. MINOCQUA – The Minocqua town board on Tuesday forged ahead with its own ordinance on licensing short-term rentals in single-family residential districts, rather than wait for the county to act. The vote was 3-1. The ordinance is in response to the state Legislature, which took away the power of local municipalities to prohibit rentals of less than 30 days in all zoning districts. Local municipalities are allowed to prohibit rentals for less than seven days, which Minocqua does so with this ordinance.